Jester has been DNA profiled ~ enabling genetic identification. We were counting the sleeps until little Jesters arrival ~ & it was love at first sight! Named for his father 'Feste' who was the court jester & 'the fool' in Shakespeare's comedy "Twelfth Night". Never was a puppy more aptly named as he is a constant source of laughter, fun & joy. He is also the noisiest dog in the whole world! Oh what a racket he makes if ignored or out of sight of his humans! Puffing his chops out & yodelling & carrying on like 'the fool'! It's a good job we adore him! 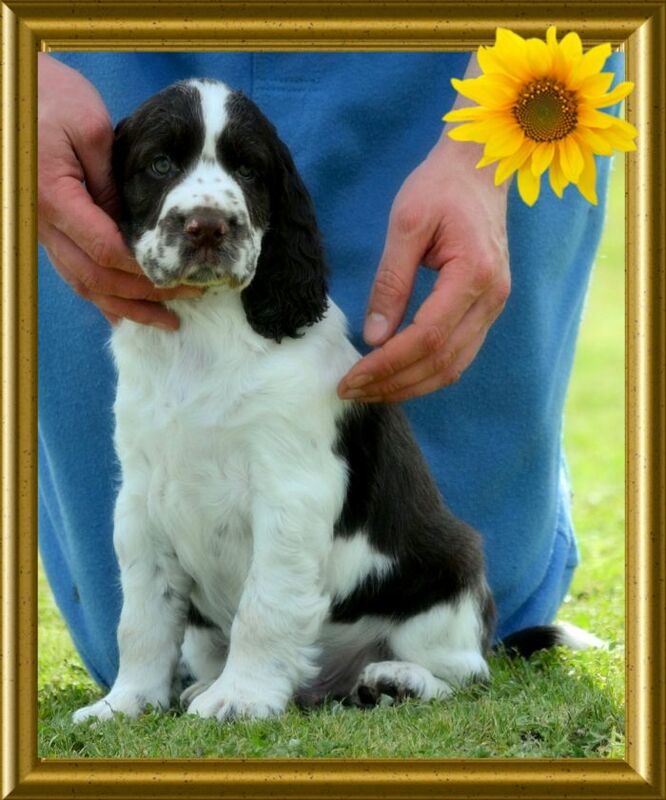 Such a stunning young Springer & a winner from his very first show appearance where he was sashed 'Best Baby Puppy in Group'! He strutted out into the ring as if he had been doing this dog show thing for years! So bold, confident & strong ~ making new friends & attracting many fans as the evening progressed. He really had some amazing results in 2014 ~ his début season. At his first outing as a 'Minor Puppy' (& 6 months old to the day), he was sashed Runner Up In Group (Group 2nd), not only did he beat many experienced, mature & highly titled Gundogs, he also left our Meazle (his kennel mate & Australia's first Supreme Champion) in his wake! He went & added yet another Runner Up In Group (Group 2nd) award to his résumé a few weeks later & then continued on his winning way to finish off his rookie year with half a dozen Class in Show awards & a staggering 30x Class in Group wins! It would be fair to say that Jester had an outstanding first year in the competition arena! Seems the world just can't get enough of his over the top puppy cuddles & he is more than willing to oblige! Jester has to be bravest & friendliest little Spaniel ever & if he continues to tackle the showring & life in this fashion his future looks very promising indeed. He has the super ground covering movement so sought after & required in his breed, eating up the ground as cleanly as his little hairy spotty legs will carry him! So very true to type & with correct angles, bone, movement, a gorgeous head, expression & an attitude to die for, we are really looking forward to seeing what the rest of the world makes of him ~ although we are quite certain that he will continue to steal hearts. He has already mastered that handy little trick! Sired by the late 'Hathaway Feste' (a truly beautiful dog that although exhibited sparingly did extremely well), & out of the evergreen 'Grand Champion Arawhiti Shoot'N Star (imp NZ)', our own resident little clown (in his fluffy harlequin 'Jester Pants'), is so well bred he qualifies as English Springer Royalty. There isn't a bad name in his pedigree, it really does read like a 'whos who' of ESS breeding ~ his is truly a bloodline that is simply timeless & absolutely classic.